Halloween is just around the corner! Is your home frighteningly festive (I couldn’t help myself!)? The ideas and options are endless when it comes to decorating for the holidays. 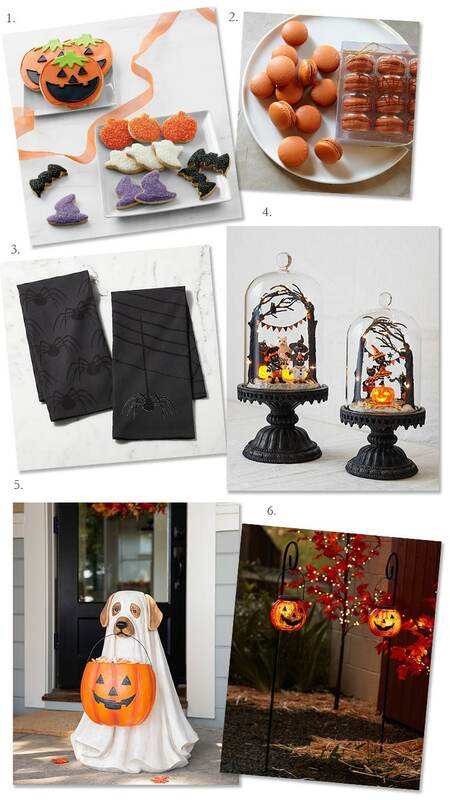 I have gathered a few favorites for the season – from macarons to ghost dogs. Enjoy! A gift box filled with delicious Halloween cookies. What a sweet gift or party treat! Add a plate full of these pumpkin pie macarons to your dessert table and you’ll be the hostess with the mostest fancy treats! These scary, yet sweet, spider napkins will add a pop of chic to the dinner table. I love the idea of adding a little whimsy to Halloween decor – these cute cloches filled with trick or treating cats are sweet perfection. As a dog lover, there couldn’t be a better Halloween greeter than this life-size ghost dog! You’ll be the most popular porch on the block with that bowl of candy! Add a little atmosphere to the front yard with these solar pumpkin pathway lights and light the way to the front door for little trick or treaters. ← Let’s design your dream space in a day!